Not for sale to Qld customers as it grows too well (declared a weed). A wonderfully fragrant and cold hardy ginger to give a tropical feel to any garden. The delicate white flowers looking like butterflies are a beautiful bonus in summer-autumn to the lush green foliage. It also makes a good cut flower great for scenting the home. Can be grown in pots but is a vigorous grower and should be split and repotted each year. Sent as a bare rooted rhizome. 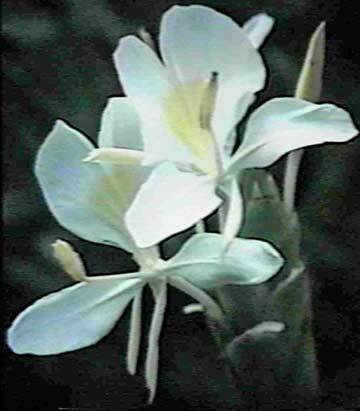 Also known as White ginger lily. Part shade. Although of tropical origins, this plant can withstand low temperatures down to about -8�C. In winter the foliage may die down to the ground, but it will quickly regrow from underground the next spring. It prefers a soil that is high in organic matter and dry winter conditions. Remove old stems after flowers have faded to promote new growth.